I've played a lot of Ascension in my day. It may be one of my most played games, mostly because it was one of my first. Ascension came out right around the time I first got into boardgaming with the likes of Small World and Munchkin. It was definitely my first deckbuilder. I really like playing Ascension. And then, as time wore on, I discovered more games. I found Thunderstone and Euros and small scale wargames and I forgot all about Ascension. It released expansions and I bought them, more out of loyalty than interest. Ultimately, I shelved it, thinking I had perhaps moved past Ascension as a gamer. DISCLAIMER: I will be giving an overview of Ascension as a system before moving on to specifics regarding Realms Unraveled. If you know Ascension backwards and forwards, just scroll down for the meat and potatoes. Ascension is a deck builder. This means that you will be using currencies provided by cards in your deck to buy other cards to help you get more currency as well as honor (AKA victory points). Each turn involves drawing a hand of five cards and sequentially playing cards from your hand to gain currencies to buy cards, defeat monsters, and gain honor. Purchased cards go into your discard as well as the cards you drew to start your turn when you're done. Draw a new hand of five and repeat! You may be familiar with other deck builders like Dominion, Thunderstone, or Tanto Cuore. I term these "village" deck builders. This means that the cards you can buy are, for the most part, fixed. You have a complete set of cards in the center and a finite number of them to buy. Everything is available to everyone until the stack runs out. Ascension falls into a different category called the "center row" deck builder. The key difference is that, instead of a fixed pool of cards everyone can buy from, there is a randomized stack of cards and only six to choose from. Once that card is purchased, it is gone unless there are additional copies in the stack. The stack is diverse and the available power level can have a high level of variance from turn to turn. It can make it difficult to plan your turn in advance, especially if there are several players and the center will clear once or twice before your turn. Other popular examples of this are Star Realms, Marvel Legendary, and the series of Cryptozioc deck builders like DC and Street Fighter. To start a game of Ascension, thoroughly shuffle the center row deck and place it to one side of the play area. On the other side, leaving room in the center for six cards, comfortably spaced, place the Heavy Infantry, Mystic, and Cultist in separate stacks. Using the clear and red crystals, create a pool of honor that equals thirty points per player. The red crystals are worth five honor, the clear are worth one. Set this to the side. Each player will get a starting deck of ten cards that they should shuffle. Randomly determine a starting player and then reveal the top six cards from the center row deck, face up, in the play area. Each player draws five cards from their personal deck and the first player begins with play proceeding clockwise around the table. You begin the game with a starter deck. This deck is comprised of ten cards - eight apprentices and two militia. These cards represent the two forms of currency in the game - runes and power. In the center of each apprentice is a white triangle with the number 1. This means that, when he's in your hand, that card is worth one rune. This is used to buy cards in the center row, which I'll talk about below. Likewise, in the center of each militia is a red circle with the number 1. This means that, when in your hand, the militia is worth one power. This is used to defeat monsters in the center row. By and large, the cards you purchase will provide you with runes for more purchasing or power for more defeating. Many have additional effects that further facilitate these ends. There are three types of card you can interact with in the center row. Heroes and Constructs are cards that you purchase with runes. When you purchase a Hero or Construct, you place them into your discard pile to be used on a future turn. When you draw a purchased hero, it is played as a one-time effect and discarded, just like the Apprentice and Militia. Constructs, however, are placed in front of you and remain there for the rest of the game, often providing bonuses every turn or when you do something that triggers their bonus. They will never leave play. 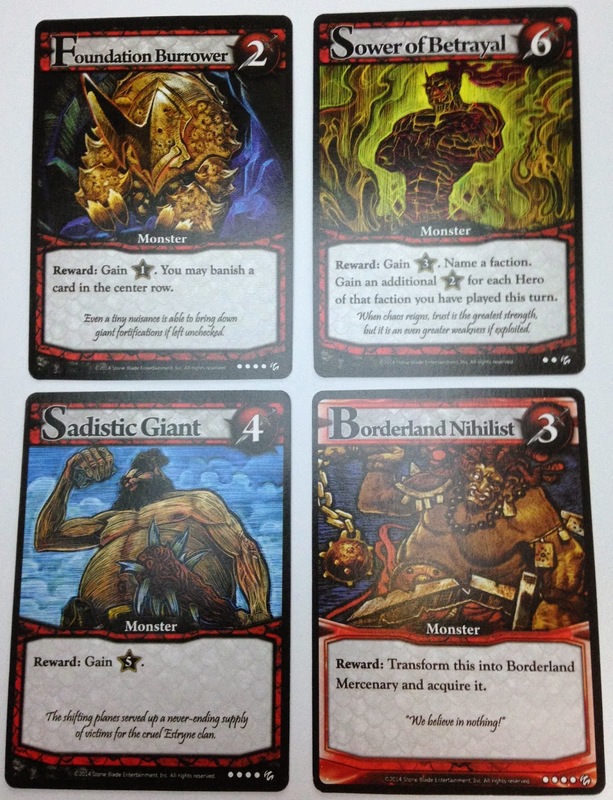 The third type of card are monster cards. These are defeated using power, indicated by a circle with a number on it. Instead of going into your deck, monsters are banished to the Void and reward you with honor and, occasionally, additional effects. Each turn, you start with five cards from your deck and play them in front of you, executing their abilities as you do. Runes and Power go into an imaginary bank to spend whenever you want to. Abilities on cards should be used at the time of play unless the indicate that they can be used any time during your turn. When you're ready to spend your resources, there's no specific order, just defeat or purchase what you like. Each time a card leaves the center row, for whatever reason, it is immediately replaced and the new card is eligible for defeat or purchase. To one side of the center row are deck of cards that are always available for defeating or purchasing. The Mystic is an upgraded Apprentice, offering two runes instead of one. Likewise, the Heavy Infantry is an upgraded Militia giving two power rather than one. These cards are great options for when you either can't afford a card in the center or your strategy would be hampered by purchasing what you can afford. 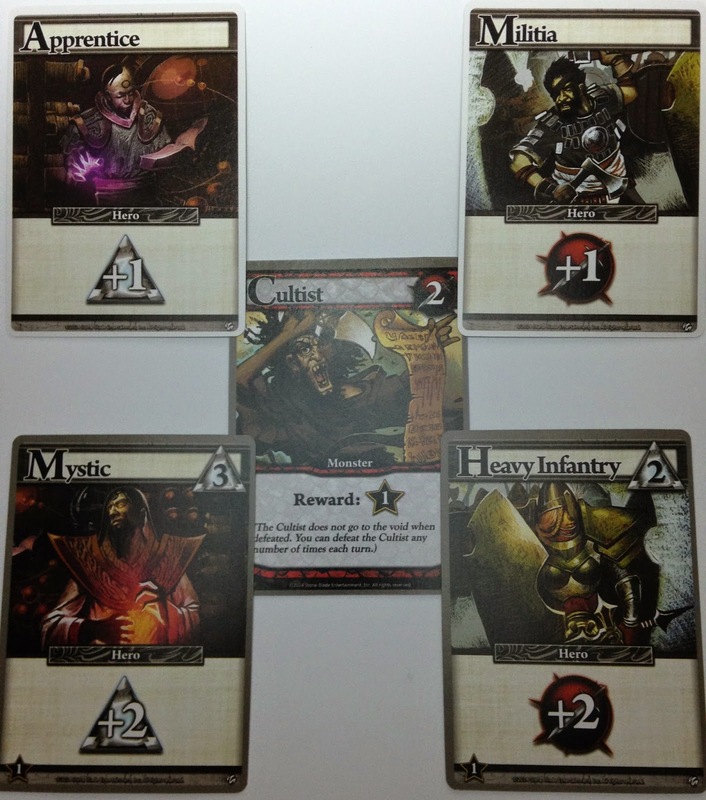 Leftover power also has a target near the Mystics and Heavy Infantry - the Cultist! For two power, you can kill off a cultist (from what must be an infinite supply) for one honor. This can be done as many times as you like. Got a lot of power and no monsters to clash with? Slaughter Cultists by the bucket load! As is the case with most deck builders, there's going to be a lot of shuffling. When your deck is empty and you're required to draw a card, whether it's the end of your turn and you need a new hand of cards or a card effect calls for you to draw a card, you will shuffle your discard and place it face down as your deck first. When the pool of honor crystals is empty, it triggers the end game. Players will finish the current round and can still gain honor from the extra provided. Once the last round has concluded, players will take all their cards, including constructs, and look at the small star on the bottom left of each card. This indicates the number of points that card is worth for being in your deck at the end of the game. Total up the value of honor in your deck and add it to the honor you accumulated in crystals. This is your final score. The person with the highest score wins! Okay, what makes Realms Unraveled so good?! Let's talk about mechanics unique to A:RU. The first is multi-unite. This is the improved return of an old mechanic. It will give you a bonus effect when you play a hero with a faction that matches the faction of the card with the multi-unite mechanic. For example, a card may give you 1 power by itself but it may also say "Multi-unite: +1 power". This means each time you play a hero of the same faction, you get +1 power in addition to the effects that card provides. WAIT WAIT WAIT WAIT! What are factions?! Oh, right, factions. Forgot that tidbit. The world of Ascension is home to four factions - Void, Enlightened, Lifebound, and Mechana. Each faction has a closely associated color (purple, blue, green, brown, respectively) and, usually, is closely tied to a specific ability. Void is the giver of power. Most Void cards grant power to kill monsters. Also, (almost) entirely unique to Void is the ability to banish cards (remove them entirely) from your deck. This allows you to shape your deck into a streamlined killing/buying machine and get rid of those pesky Apprentices and Militia clogging your hand every turn. Nothing but pure power, baby!! Enlightened is all about card draw and interacting with the center row. No one draws extra cards into your hand like Enlightened does. While this may seem very powerful, it's possible to focus too much on card draw and all your cards just draw each other and don't actually do anything useful (I'm looking at you Tomas...)! Enlightened has a secondary ability that allows you to interact directly with the center row, be it to claim a hero for free (WOW!) or banish a card your opponent wants to get something you can buy. Lifebound is the unquestioned master of honor. Most Lifebound cards give you honor just for being you. "Take 1 honor." "If you control two or more constructs, take 2 honor." "Gee, thanks Lifebound! You're awesome too!" 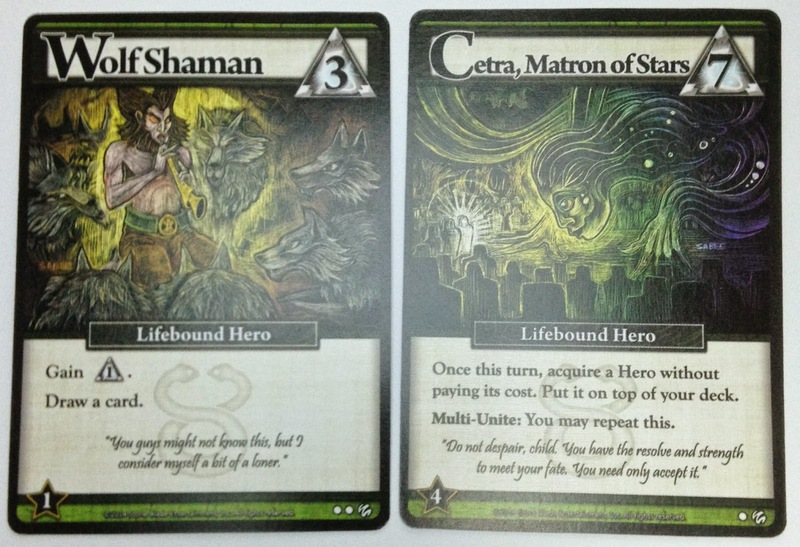 Lifebound also likes to dabble in card draw and gives a good deal of buying power via runes. Mechana does not play well with others. Well, that isn't entirely true. One of my favorite strategies is Enlightened/Mechana decks. It may play well with others, it plays alone even better! 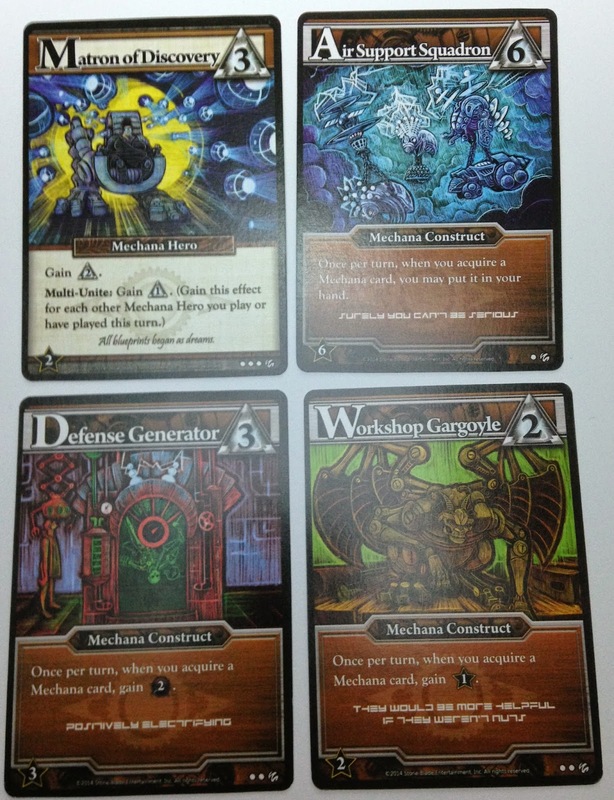 Mechana has more constructs than the other factions - combined. Each non-Mechana factions has access to one unique construct in the game. 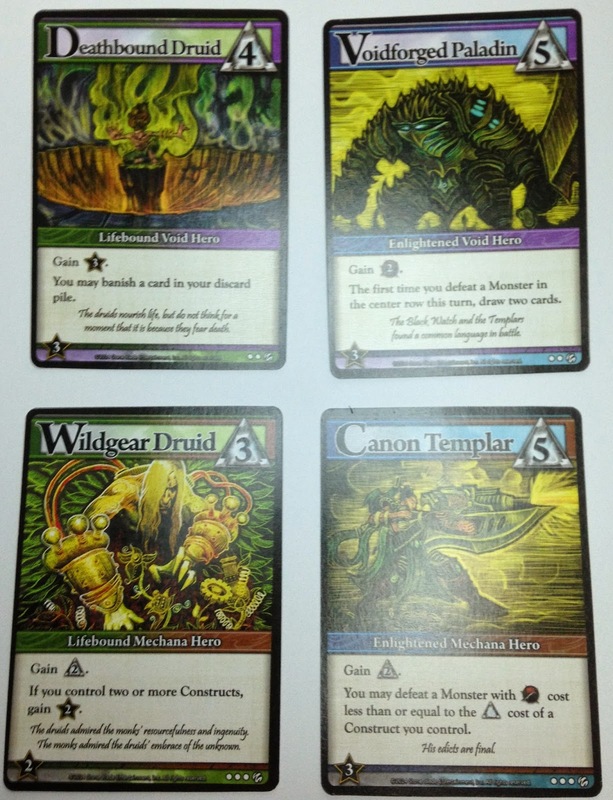 Mechana has access to six unique constructs. These stay in front of you once you draw them and provide you with bonuses when you purchase other Mechana cards (purchase - not play - heroes or constructs; veterans of Ascension will understand this important distinction). Beyond enjoying their toys, Mechana covers a respectable section of abilities including gaining honor directly from the pool, gaining power, and getting runes. That seems important, glad you remembered it! So where were we? Right, multi-unite. Remember that example? "Multi-unite: +1 power." Well, it's on a Void card. That means for each OTHER void hero you play, you'll get +1 power. Pretty cool, right? Now imagine a card that says "Once this turn, acquire a Hero without paying its cost. Put it on top of your deck." Whoa! A free hero of your choice? And on top of your deck?! How awesome! It also says "Multi-unite: you may repeat this." WHAT?! So for each additional Lifebound hero you play, you can do this again. 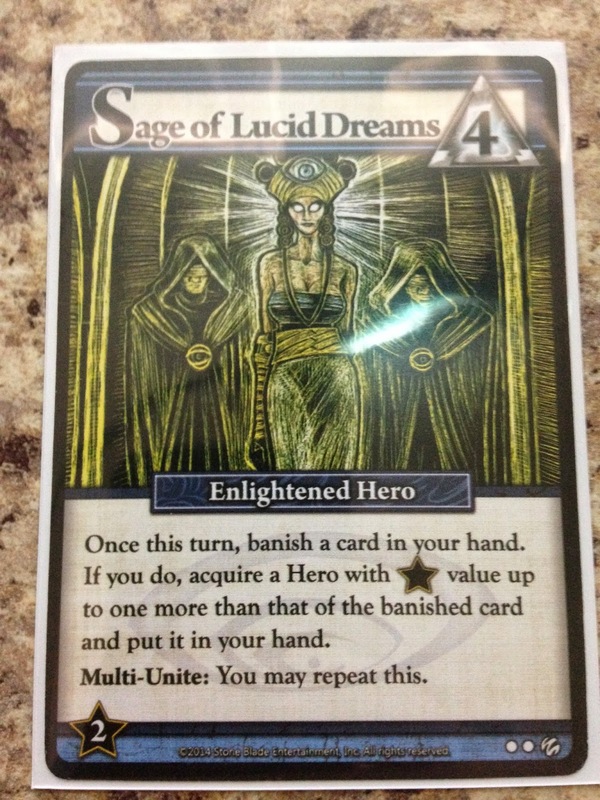 Ascension: Realms Unraveled calls this card Cetra, Matron of Stars. I call it "God Mode". So as slick as multi-unite is, it's still not the coolest mechanic in the game. To explain that, I need to do a flashback to an earlier time. Ascension: Chronicle of the Godslayer was fresh and new and I was excited to play it. I played it a lot. There were some very, very powerful cards in that box. The only issue was that, when they came down, it was a lottery as to who got them. They appeared randomly and the first person with the runes to buy them got to do it. When they came up in your hand, you were living the dream. It was huge power for minimal effort. Fast forward to Ascension: Storm of Souls. Now we're trying to curb this power and make it a challenge. Enter Soul Gems. These were the spirits of cards from the first game that could be used for free when you were told to draw one by a card in your hand. They were...lackluster. None of them were mega-powerful cards and accessing them felt sparse. Fast forward again to Ascension: Rise of Vigil. This time, we're adding power shards! They add a third resource that's a threshold to meet and you can do cool things when you-- wait. You know what, skip it. It didn't work. Sorry. Now we come to Realms Unraveled. The ultimate question for any Ascension fan: how do you handle giving out powerful cards and powerful combos without making it a lottery system? One answer... TRANSFORM! (not just for Michael Bay movies anymore!) A transform card is a card that can become a better card when you fulfill certain requirements. The easiest transforms require that the transforming card be in your hand when you play a matching faction. More complex transforms involve there being eight monsters in the Void or gaining three honor in one turn, all while having not yet used the card that is transforming. There are two options for transformation in the game. 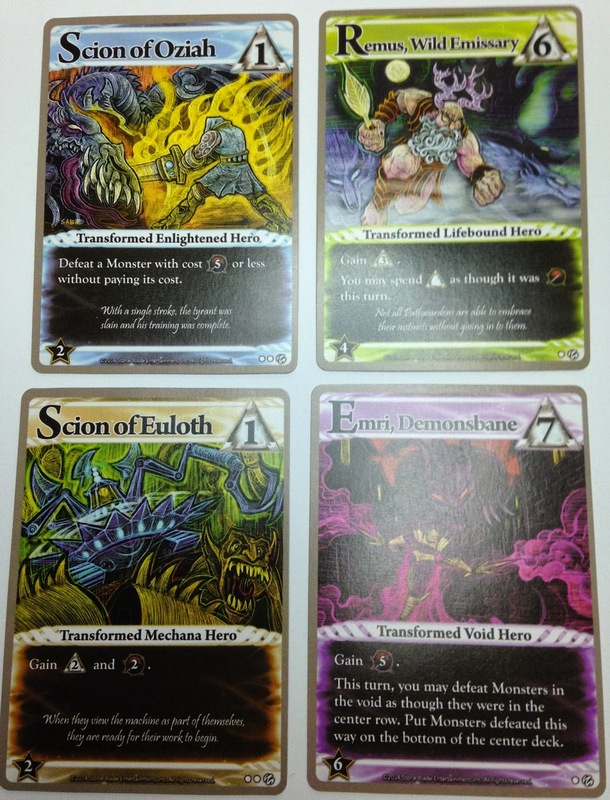 It comes with single sided versions of every transform card intended to be used when you play without sleeves. This way, the center row always shows the back of a card. When you transform a card, you remove the weaker version from the game and scan through a deck to the side that holds all the transformed versions of cards. You just have to remember to swap it out when the game is over. The box also includes double sided versions - the weaker version on one side, the transformed version on the other. This way, you can sleeve the game in opaque sleeves and, when called upon to transform, just slide the card out of the sleeve, flip it, and put it back in. This is my preferred way to handle it, but not everyone obsessively sleeves like I do. Transformed cards are more powerful versions of their former selves. This could mean the difference between getting one rune and one honor and getting two of each instead. It could mean the difference between getting three runes and getting four runes and being able to use all your runes that turn as power instead! Transform is a huge element to this game and is a great way to include incredibly powerful cards that require the right circumstances to pull off. Now I have to talk about factions again. Seriously. Again. We did this. I know, but this is cool. One of the challenges that older versions of Ascension had was encouraging synergy between the factions. They didn't get along well and rarely enabled one another to do cool things. You could go multifaction but it was a bit like trying to shuffle cards by just jamming them together instead of delicately shuffling them. It got the job done, but it wasn't pretty. A:RU has solved this as well with the introduction of multifaction heroes. These are heroes that represent two factions and have powers from each. 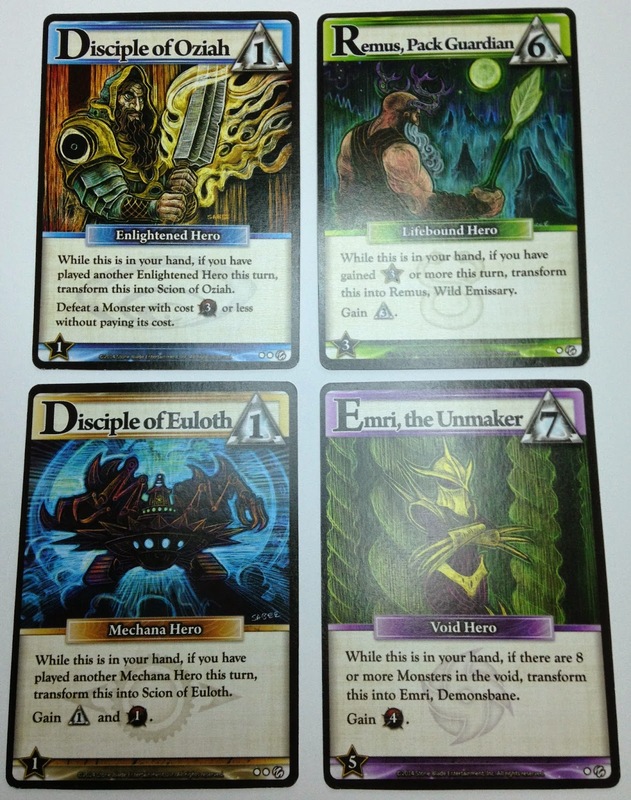 They also feature unique card frames that reflect both of their factions. A Mechana Lifebound hero will give you runes for purchasing as well as two honor if you control two or more constructs. 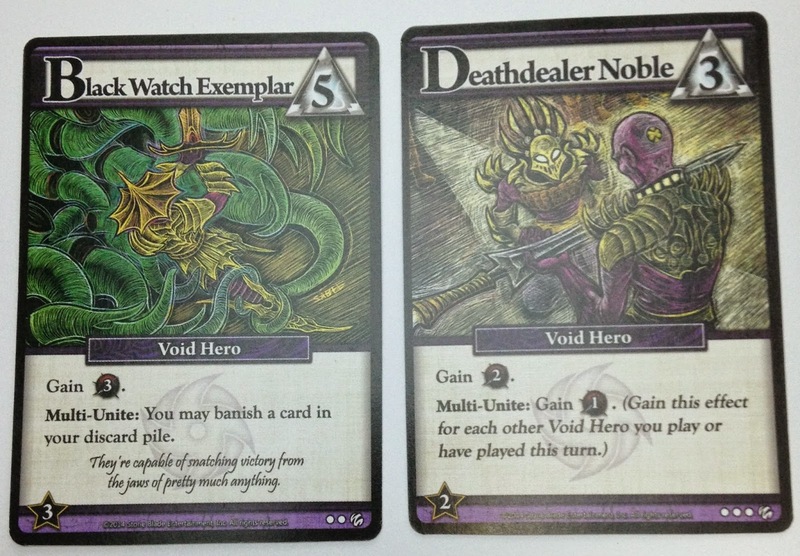 A Void Enlightened Hero will give you two power as well as allow you to draw two cards the first time you defeat a monster in the center row (not that measly Cultist!). These multifaction heroes also count as a member of both factions for transform and multi-unite effects. This inclusion in the game is probably the best thing Stoneblade Games did for this series. It allows you to build a deck that can specialize in more than one area without feeling clunky. I can pursue Lifebound/Mechana and cards from both factions will boost each other. There's no way this isn't a great, great thing. The components for this game are nice and straight forward. The game comes with plenty of honor crystals for four players plus spares for when the supply runs out. The inclusion of both single sided and double sided transform cards, giving players a choice of how to use them, was an excellent idea and the sleeving community thanks Stoneblade heartily. Probably the best thing about this game, from a components standpoint, is the change to the art, color, and graphic design. The cards are brighter and the art doesn't look like it was created for a mid-90's demon-themed-end-of-the-world action movie (that may not make sense to you, but it works for me). The layout of the cards is clearer and cleaner. Gone are the colored symbols denoting rarity of a card. This time around, just a simple system of pips telling you how many of that card is in the center row. Transform cards are also subtly unique in a way that they gel with the rest of your hand but you can tell they are special. When it comes time to breakdown your deck and return everything to it's starting state, all the cards that need to be dealt with in some way are easy to identify. Starter cards (Apprentice and Militia) have white borders, easy to identify. Cards from the center row in their transformed state, as well as Mystics and Heavy Infantry, have tan borders meaning they need to be separated and/or transformed back to normal. Finally, non-transforming center row cards have black borders. A lot of thought went into the design of this set and I was very pleased. I love this version of Ascension. I've played probably 50+ games, a lot of them using the solo variant, and it's just very good. The ability to mix factions for a clean, consistent gameplan is incredibly rewarding. Speaking of rewarding, it's hard to beat the feeling of transforming that card and getting the amped up power level that comes with it. If I had to list a complaint, it's the one I have with all center row deckbuilders - randomness. Especially in a game that uses victory points as a win condition, it can be very punishing to push one strategy and have the Gods of Chance rain on your parade. If you decide to push Void and go for monster killing, you're likely going to have a weaker deck at the end of the game, hoping to make up for it with crystals from the pool. But what if 90% of the monsters are buried on the bottom of the deck and you never see them? Wasting all that power on dozens of Cultists can be a real kick in the teeth. Luckily, I feel like Realms Unraveled did a great job of mitigating this because of the multifaction heroes. You can go Void and Lifebound so that, even if monsters don't show up, you're still pulling that honor from the pool and your whole gameplan wasn't a bust. If you're looking for a solid deck builder with excellent mechanics and an incredibly rewarding experience, I highly recommend Ascension: Realms Unraveled. If you're a veteran of Ascension, this is definitely one to add to the shelf. If you're new to Ascension, you owe it to yourself to check this out. See what Nick from Board Game Brawl has to say about Ascension: Realms Unraveled. 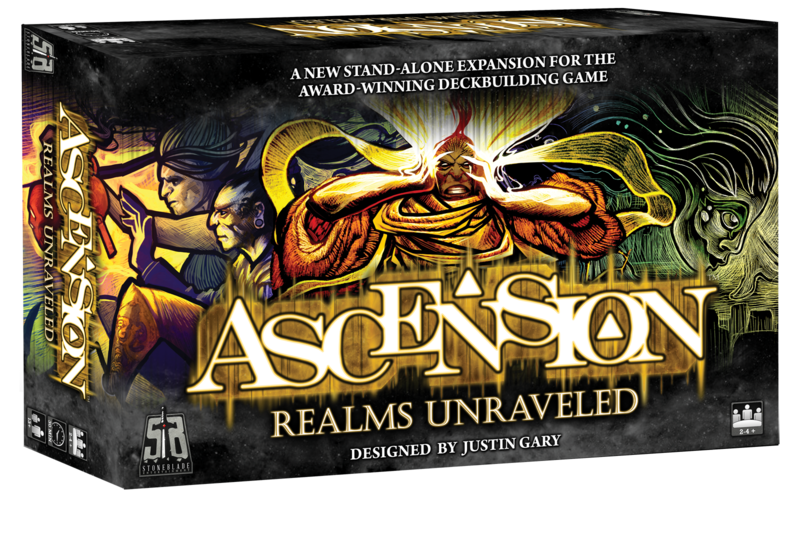 Here's Tom Vasel's review of Ascension: Realms Unraveled. Click here for BGGer ackmondual's review of Ascension: Realms Unraveled.